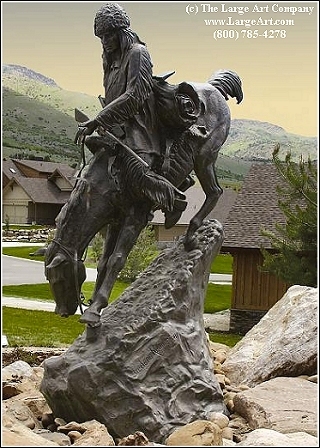 This is the Mac daddy of Frederic Remington bronze statues. This Mountain Man statue measures 133" tall (11 feet) x 96" long (8 feet) x 50" wide (4 feet) and weighs over 1,000 pounds. It is shipped on a flat bed truck and requires a forklift or other equipment for unloading. This is a beautiful statue for a public area. We have placed these at casinos, hotels, restaurants, parks, community developments and many other public venues. It is cast of pure American-made bronze and will last for hundreds of years inside or outdoors.